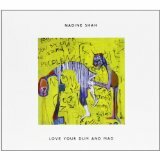 Nadine Shah has made a good, albeit slightly anonymous, debut album which has one major downfall; her purposely dour and low delivery combined with Ben Hillier’s swampy, stylistic production with tales of troubled men and put upon women positively encourages immediate comparison to the Gothic Elite. PJ Harvey, Nick Cave, Marianne Faithfull are names you will undoubtedly see in reference to Shah’s work and as the first track “Aching Bones” moans and trudges into view there is no getting away from the similarities between this and Harvey during her exaggerated and traumatised blues vamp that she inhabited during her vivid “To Bring You My Love” period. Drawing comparisons to such iconoclasts is a risky business but “Love Your Dum and Mad” goes some way towards proving that there is enough room for everyone. The first half of the album is packed out sonically, full and dusty with looped samples and reverb. Songs like the excellent “To Be a Young Man” and in particular “Runaway” (‘Did you ever stop to notice I too worked hard to build this home, and now I am of no use to you now that the children have grown’) are character-based songs sung in the first person with Shah deliberately exaggerating her northern accent, she sings with it throughout, to colour the mood wonderfully. Later on the album does she confuse slightly with more traditional ballads such as “All I Want” which could be an Adele song, it’s soulful and surprisingly radio friendly with its electronic piano and ‘just sit in cafes and not say a word’ refrain. Another slower song and early single “Dreary Town” (an Adele song title if ever there was one!) is nice but considering its autobiographical relevance here (it’s about a former lover of Shah’s who because of bipolar disorder subsequently killed himself) it doesn’t pack the punch that it could and should. “The Devil”, a song title so ubiquitous within the genre that not only has Anna Calvi, who was 2011’s PJ Harvey, but Harvey herself had ‘Devil’ songs and Shah’s attempt will almost certainly not be remembered as an essential addition to an already overcrowded collection and to include it here seems at best ill-advised. The deceptively hypnotic “Floating” does a lovely thing very early on and positions a very David Lynch type twanging, distorted instrumental break right where there shouldn’t be one; its beauty is slow burning and unsettling. “Filthy Game” is this album’s attempt at a “Surabaya Johnny” and Shah is a convincing, worldly-sounding narrator. Nadine Shah has been making this record for four years and this goes some way towards explaining the varying levels of maturity that are evident from song to song; it’s a very grown-up record or at least wants to be but is occasionally betrayed by volatile songwriting with Ben Hillier’s production sometimes resembling too many other similar artists. Shah has an amazing voice and does not descend into histrionics where others would; given the potentially melodramatic subject matter here the temptation must have been great and her controlled performance throughout the entirety of “Love Your Dum and Mad” is indeed its greatest asset.